The REAL Reason FEMA Promotes Emergency Preparedness? FEMA and the rest of government seems quite paranoid about disasters of late, but clues suggest there are hidden reasons behind urging preparations — not the earthquakes, floods, nor fires they talk about. Conspiracy theories based upon dialogs by geophysicists, astrophysicists, and politicos seem far more likely the cause, and that puts a whole different face on what ‘preparation’ should involve and mean for you. Why is government pushing emergency preparedness? copyright © 2013, all rights reserved. Permission to repost hereby granted provided entire post with all links in tact, including this paragraph, are included. Can we really trust FEMA? What is the history of the emergency broadcast system? I very clearly remember the ‘Red Scare’ spillover from McCarthyism which translated to ‘fear the bomb’ in the 1950’s and 60’s… starting with the Eisenhower White House: Air Raid sirens were tested weekly or daily, typically at a fixed time of day as if a Church Bell announcing Noon. I was a teen during the Cuban Missile Crises under Kennedy, when talk of the day was the home Fallout Shelter, and at school, we had ‘duck and cover’ drills as often as fire drills. But the scare wore off by the 70’s, and sirens and shelters were no longer in vogue, though every downtown building tended to have a well marked public shelter. Yawn. Fast Forward, Bush I White House: For no visible or announced reason at all, the Emergency Alert System (EAS) and CONELRAD Radio alert system which had in evolutionary form driven those sirens for two decades was turned back on in the 90’s, and updated for improved use with TV. But rarely was it tested, and then typically late at night between late-show snoozes. Just fire drills at school. No more sirens, unless there was perhaps a fire or other actual emergency. Very unobtrusive. No problem. Fast Forward, Bush II White House: Suddenly, somewhat synchronous with the formation of Homeland Security, these alerts started increasing in frequency and were randomly interrupting all manner of broadcasts at any time of day. They now had the ability to actually take over newer televisions, even if turned off or in use with a VCR at the time. Somewhere along the way, it was expanded to include hazardous weather condition reports and the AMBER ALERT system for missing children. Schools still worried about fires. OK. Well, perhaps. What kind of threats should an emergency preparedness plan address? Fast Forward, Sorento White House: Suddenly, and synchronous with DHS seeking to buy 1.4 billion rounds of ammunition (that’s several Vietnam wars worth), all over and above military orders… not to mention a long list of equally disturbing purchase efforts involving coffins, ‘emergency housing’ which more closely resembled prison camps, food and water stores, vaccinations and anti-biotics… numbering in the millions more often than not — the tests started increasing in frequency and in duration. Annoying. Suspiciously omnipresent, excessively foreboding. What bothers me most is a synchronous rush request for proposals on delivery of emergency preparedness items and relocation and readiness orders to military to FEMA Region III (Atlantic Seaboard States near D.C.), all with a date of October of this year. 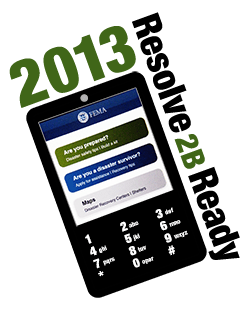 In fact, much of FEMA’s promotional material is geared to 2013, specifically. Most of the darker things cited in this post are happening right now in 2013 or otherwise generally depicted as an immediate potential threat. Also simultaneous are geo-political and financial threats the likes of which have never been seen in the history of the planet, each threatening dire unrest to the point of forcing Martial Law. While this goes on, the sun is spitting gigantic record bursting electromagnetic pulses at us and the pole is shifting, Fukushima is continuing to increase its threat, not to mention shifting weather patterns and an increase in seismic activities of Biblical proportions. Dare I mention strange phenomenon like objects orbiting the sun, mysterious loud and scary sounds heard over thousands of square miles, two suns and other oddities in the skies day and night? Endless wars somehow always tied to terrorism and oil keep being announced. No wonder large numbers of people are actually starting to think End Times might actually be around the corner. The end of oil supply as we know it indeed approaches. Extremist terror groups pose theoretical threat of biological, chemical, or nuclear WMD. Criminal nations threaten to attack us with nuclear weapons. China is on the verge of surpassing the US as super power, and their top military leader has said war with the US is inevitable; their only answer to that being to strike first. Man-made bio weapons, nanotech, and even genomic weapons are being developed daily by all modern military powers, and we get cover stories expressed as worries of a natural pandemic outbreak of catastrophic proportions. The Center for Disease Control has even gone so far as to talk about preparation for a Zombie apocalypse, and there is some evidence it is not as tongue-in-cheek as they profess. Don’t forget chemtrails and the feared NWO depopulation plot. The worst part is all the talk about a possible military takeover, martial law, a new Constitution and a North American Union. Why, that’s nothing short of saying the Antichrist is coming to power… and some say that’s the case, too. Agenda 21, GMO crops, Codex Alimentarius, the Small Arms Treaty (goodby 2nd Amendment), etc. All these things tie in one to another as if all by some organized conspiracy (Illuminati?) After all, they say, the Norway Spirals were likely a test of Project Bluebeam, to simulate with a kind of holographic event the Second Coming in the Antichrist’s name. And what about those tens of thousands of ‘State of Martial Law’ warning/instruction signs coming into the US from foreign sign makers in convoy manner? Really, really not good. Almost everyone has some kind of foreboding sense that SOMETHING bad this way comes. Armageddon Online has a more detailed summary view. And just as someone chooses to discounts all of these things as ‘baseless,’ something like this comes along to make us wonder all over again: a lot of people are saying there is a purge of the military taking place, and that usually portends a violent overthrow of government. So, quite naturally, some of us are taking the DHS/FEMA advice to heart, or at least considering it. But I fear most of us are preparing for the wrong thing in the wrong way. Its one thing to have food, water, medical, and key supplies stashed away for an earthquake or flood… and another to truly be prepared for upheavals of the political or Biblical sort… the sort government advice is NOT addressing, because if you were prepared for that, government looses the ability to maintain political control through dependency upon government for survival. Why should I hide my emergency preparedness kit and weapons?